So a few weeks ago, I offered up the DorobekInsider Guide: Experimenting with Twitter, Part I… and at that time, I promised that I would offer up a list of people worth following. You see, one of the biggest challenges with Twitter (much like real life) is building your network. If you tweet and there is nobody to hear you and you can’t hear anybody, well… you will never know what it is like. So I started earnestly creating the list… and then I was notified (via Twitter) about lists that already exist. Third… The AlleyInsider has a list of government sources on Twitter. I should also mention that Federal News Radio’s Federal Drive with Tom Temin and Jane Norris featured Laura Fitton of Pistachio Consulting (follow her on Twitter), a company that specializes in Twitter and other Web 2.0 technologies. You can hear that interview here. I also post many of my Twitter related links and stories at delicious.com/cdorobek/twitter. You can also follow Federal News Radio on Twitter… twitter.com/fednewsradio. Don’t get it at all? Feel overwhelmed by the whole thing? I mentioned this before, but it is worth mentioning again… One of my favorite — and one of the easiest — comes from the remarkable team at Common Craft, who produce these wonderful “plain English guides” to all sorts of things — mostly technologies… and including Twitter. Well, it appears that there is a new transition feed — using the Twitter lingo, it is @change_gov. It is essentially an auto-Feed of news and blogs from the office of the President-elect Barack Obama’s Change.gov Web site. The @change_gov feed isn’t well known yet — there are only 28 people “following” @change_gov so far. By contrast, @BarackObama has 132,016 followers. You have probably heard about the Web site Twitter, the microblogging site. And there are many explainers out there. One of my favorite — and one of the easiest — comes from the remarkable team at Common Craft, who produce these wonderful “plain English guides” to all sorts of things — mostly technologies… and including Twitter. Essentially Twitter asks the question: What are you doing now? And people post their answer — in 140 characters or less. Simple as that. The biggest issue with Twitter is building your network. Like many of these information sharing sites, they are only interesting if there is information to share and somebody — and somebody interesting — to share it with. So this is something akin to a guide to who you can follow that would give you a taste of what Twitter is… and, perhaps, begin to understand it. Let me put my caveat here at the top: I’m not totally convinced yet. I do find Twitter interesting and valuable in many ways — I have found interesting people via Twitter that I may or may not have ever met before… and I have certainly found stories and information that I probably never would have found before. But there is also a lot of clutter there — people posting about their delayed flight or where they are right now. Some of these posts — including some of my own — leave me wondering: Why would anybody care? But there is even more here, I think, and this is why I find Twitter particularly interesting… it is a platform to allow people to share information. I posted earlier about the Twitter Vote Report project, where people could feed information using Twitter or text messages, about their experience at the polls on election day. Those tags could then be tracked and monitored — by all of us. Talk about transparency and information sharing. Another powerful example comes from those horrible San Diego fires last year that destroyed scores of homes. People ended up banding together to get information about their neighborhoods using Twitter. Set the data free… build the platform… and people will use that information in ways that we don’t fully anticipate. And I’m not the first person to watch Twitter, of course. Harvard Business School Prof. Andrew McAfee — the guy who is credited with inventing the term “enterprise 2.0” — wrote about why Twitter is interesting on his blog recently. So for a number of reasons, I find Twitter fascinating… but I’m not yet totally convinced. But in the end, these new tools are quite easy to use — and you have to at least experiment with them to understand them. So… perhaps we can learn together. In the meantime, if you want to follow me… www.twitter.com/cdorobek. Eight days after the election and the Twitter feed of Barack Obama has gone silent. Now President-elect Obama has recieved a lot of praise for his use of social networking to stay in touch with voters. And he received praise for using the microblogging site Twitter, which essentially asks the question: What are you doing now? And Obama’s campaign would post links to campaign informatino and videos. 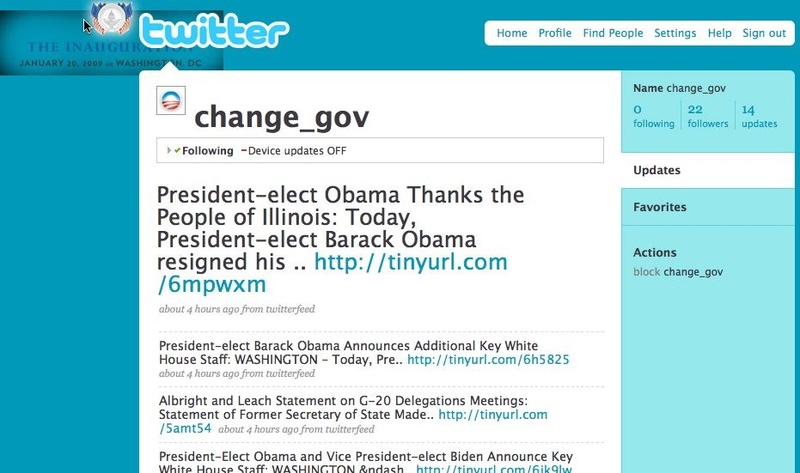 Obama’s Twitter feed, which can be seen at twitter.com/BarackObama, has 128,043 people following it. But the last post was on election night. @barackobama: Please update your Twitter. Since last Tuesday’s historic election, Barack Obama’s Twitter account hasn’t sent any messages. Some Internet President-Elect! He didn’t even use Twitter to announce his transition website, change.gov — and what is Twitter for, really, if not spamming your friends with your latest URL? There’s no better sign that his 127,196 followers have been pumped and dumped — Twittered into contributing money and time, and then passed over for more presidential means of communication. Like, say, press conferences. Ah, one of the challenges of the connected world — people actually want to stay in touch. AND… don’t know what Twitter is or why people use it or for those of you who are at all curious, tonight, I’ll post my Twitter primer — who to follow on Twitter to get a feel for what this is. Read more about this at gartner.com/economy.